Oslo Opera House is probably the most important contemporary building in the whole of Norway. It’s an eye-catching building not only for its urbanism but also for the sense of culture it exudes and its bold, imaginative forms. Work was completed in 2008, just a year after construction began. It was designed by the Norwegian architectural firm Snohetta, which was also responsible for the Norwegian embassy in Berlin and the new library of Alexandria, the Bibliotheca Alexandrina, in Egypt. Externally, the whole building is sheathed in glass and white marble. No ordinary glass either—the specification called for a particularly thick glass, which would normally have acquired a greenish tinge when seen from a certain remove. This would have upset the tonal balance of the building as a whole, and therefore the architects elected to use ultrawhite glass with low iron content. The main auditorium seats 1,364 people and lies 16 metres below sea level. Hanging from the ceiling is a chandelier seven metres in diameter. It weighs eight tonnes, and has over 8,000 light bulbs and 5,800 pieces of faceted glass. In all, the complex has some 1100 rooms. The total cost of the project was 528 million euros. The acoustics of the building have been widely praised. It has already hosted a considerable number of performances in its various auditoria, and each time the acoustics have been perfect. A quality which places it among the leading cultural venues in Europe. Oslo Opera House is strategically located in the city’s port district, not far from the city centre, and is set against a natural backdrop. It was designed as a place for the public to visit, with a wide frontal plaza that slopes gently into the sea. The interior is prefaced by a warm, spacious lobby combining materials such as wood, marble and glass that imparts visual continuity between exterior and interior. 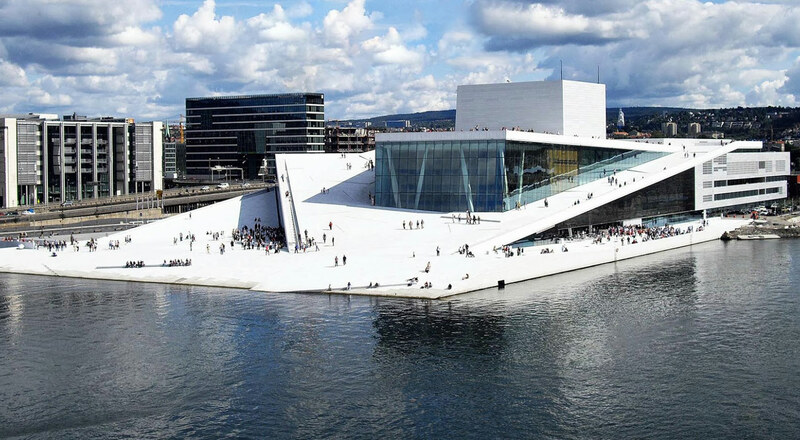 Oslo Opera House has already won a number of awards. The first came in 2008 at the World Architecture Festival in Barcelona, and was followed by the Mies van der Rohe Award in 2009.